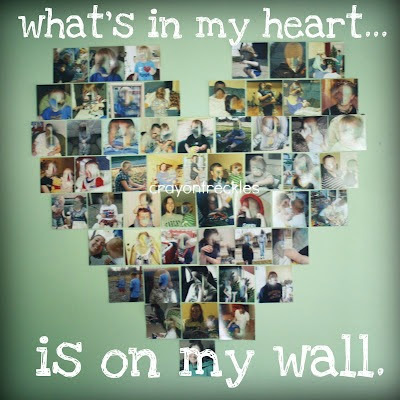 i saw this heart wall at Toddler Approved around Valentine's Day and thought it'd be so cute with all pictures. some of my favorite pictures every day when i woke up. That is too cute, you have gave me an idea for the wall going up the stairs. This is great. I would like to do this in my girls' room with some of their art. Love it!! Ours is still up and it makes me happy every day. I need to add a few more pictures though. It is fun having it as a growing piece of artwork. I love Tulip's idea of creating one just with child artwork. Please share if you do it! Thanks for sharing our post/photo friend! I have wanted to do one since I saw Kristina's on V Day, too. I think it will be a fun project to do with our child(ren) when they come home to us. I love this!! Such a fun way to enjoy all of those photos that get tucked away! This is a lovely way to display photos. When I was at uni every inch of my room was covered in photos - but this is much nicer. 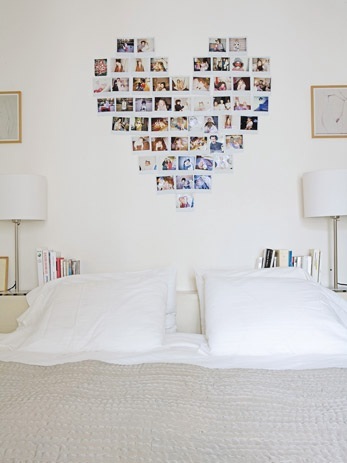 Ahhhh this is such a lovely way to display your photos! What a lovely way to display photos!! I love it! Thank you for sharing at Sharing Saturday! I hope you are having a fabulous week! That is so beautiful, never saw that idea before! Thanks for sharing Andie.